Should You Save up for a Kitchen Remodel or Take Out a Remodel Loan? If money were no object, almost every homeowner would jump at the chance to hire a remodeling company to create the kitchen of their dreams. 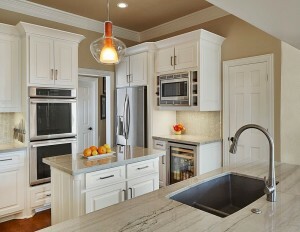 Of course, money is a consideration; often the biggest consideration that a homeowner must face when planning a remodel. If you have dreams of remodeling your kitchen, is it smarter to carefully save for a few years so you can pay for your remodel outright, or should you consider a home remodel loan? Saving up for a home remodel means that you don’t have to worry about taking out a loan. In the long run, you’ll end up saving money on loan interest payments. Taking on more debt might affect your credit score or come back to bite you if you lose your job or have a money emergency in the future. The biggest benefit of taking out a home remodel loan is that you can get your kitchen remodel right away. If you decide to save up for the remodel instead, you may need to wait years until you can finally start work on your kitchen. Ask yourself if paying a little interest now is worth the increased quality of your home life that your remodeled kitchen will bring. If the answer is yes, then it’s time to start looking for loans. If you live in the Dallas/Ft. Worth area, we recommend our preferred lender, LegacyTexas, which offers great loan rates. Jul 01, 2016 Should You Save up for a Kitchen Remodel or Take Out a Remodel Loan? Next Next post: Can I Save Money By Buying My Own Home Remodel Materials?